There's always a new trend in the world of nail polishes as I always prefer glittery and shiny shades on soft nail colors so chrome nail colors are defiantly on my hit list and they became latest trend in 2012. I'm not sure when this chrome nail polish rave began, but I really like chrome look on the nails it looks different and unique and very suitable for summer times. So, Today the thing I bought you is called Lil Bling nail polish that's a new range of myfacecosmetic include very bright summer colors they have ten different shades in this range and every shade have the same color eyeshadow. 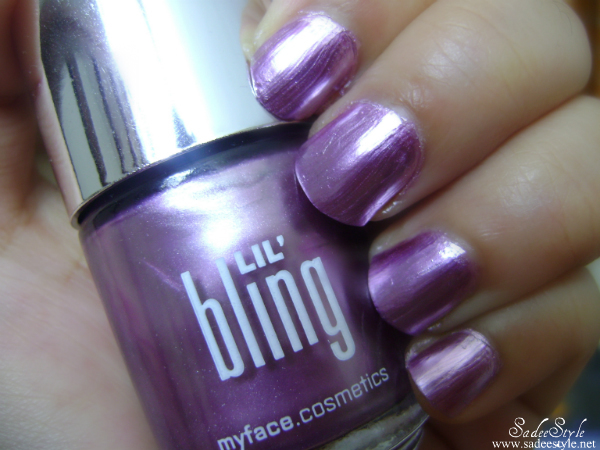 The shade I got is called Lil Bling haze that is very shiny purple color and have chromatic finishes. I'm sharing some looks to show you that how it looks on the nails. As you saw on the images that it has some streaks on the nails. I just applied two coats without any base and top coat. It looks like liquid metal with chrome finish and it dries quickly, but don't lasts for long. It looks totally gorgeous, give life to dull and pale nails and very beautiful in shine, but the fact of the matter is, I do not like the brush stroke that is really annoying and made my nails to look so tacky also it chip easily or maybe it will work fine if you use it with top and base coat. Overall I have mix feeling about this product. It costs £5.99 and can be purchased on MyFace Cosmetics Lil’ Bling polishes come in 10 different shades and are available online at MyFace Cosmetics or in store at Boots. Remember Don't forget to use the coupon code: blogbling:, while shopping from myfacecosmetics to receive the free blingtone *Free shade of Blingtone Eyeshadow to be determined based upon availability. The code is valid thru 31/5/12. I like the color and the shine. Thank you for your nice comment. Your blog is really great. Lovely colour! So funny and bright! I love this colors for nails! Thanks for your visit! I follow you with GFC! This nail polish shade looks great! Love the color and the shimmer!